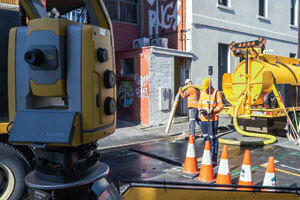 VAC Group is aiming to simplify civil construction projects by providing a complete works solution to mapping, surveying and excavating around subsurface utilities and services. For civil construction projects, a multitude of subcontractors, specialists and other businesses filling a niche or specialist requirement may be working on site at any one time. For Tony Simpson, COO of Earth Radar – part of the VAC Group – the high number of businesses involved in the various aspects of survey and engineering services on one construction project can create a real disconnect between what the client wants and what is being delivered. This is complicated by the fact many subcontracted service providers have little to no direct interaction with the overall project owners. VAC Group delivers a range of subsurface activities for civil sites, including consultancy, locating subsurface utilities and services, verification and survey, utility mapping and 3D modelling, non-destructive digging and hydro vacuum excavation and soil disposal. As such, Mr. Simpson says the business is typically engaged by subcontractors who may be working for subcontractors themselves, rather than the project owners. “At that level, three or four tiers down from where the client is, we find ourselves at the centre of a competitive process – the various parties have their own priorities – you’re then working to their priorities, not necessarily the clients,” he explains. The bureaucracy of the situation can create a disparity between what the client wants and what is being delivered. “Everyone in the chain wants to make their margin, unfortunately the costs saved by engaging the lowest conforming tender can result in reduced quality deliverables, causing blowouts later in the project,” Mr. Simpson asserts. For VAC Group – and Earth Radar – the gap is especially evident given the group’s complete service offering when it comes to mapping, identifying and excavating around underground assets. “We would like to see clients taking more direct ownership of the process around managing the risks related to the subsurface. We find our most successful projects are those where we can tailor and refine our approach through close communication with the project delivery team,” Mr. Simpson says. VAC Group is leveraging its unique equipment and technical innovation to close the gap between what the client wants and what is currently being delivered on civil sites and major projects. The businesses’ service offering begins from initial consultation through to the project planning phase through to its utility location service offering using Electro Magnetic Induction (EMI) and its purpose-built 3D ground-penetrating radar (GPR), called Latro. Latro is Earth Radar’s in-house designed and developed subsurface reality-capture system, incorporating multi-channel and multi-directional 3D GPR technology with survey grade positioning, meaning it can map accurate high-resolution underground features, utilities and anomalies. “With a 3D system, it allows us to visualise what’s in the ground, viewing the resulting 3D dataset from both top down and in cross sections simultaneously. We can look at something with real scrutiny and visual precision,” Mr. Simpson says. He says a major limitation of traditional 2D GPR systems is that they work most effectively when perpendicular to the object the user is trying to locate. Roads and footpaths, however, will have pipes, conduits and assets below the surface along different directions. The drive behind developing the Latro 3D GPR system, with its multi-channel and multi-directional antenna configuration, was to capture subsurface utilities and services accurately and from just a single scan, no matter their orientation. 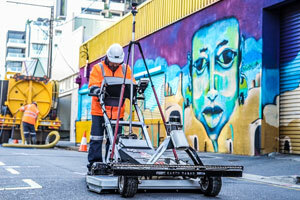 By capturing the 3D GPR data with survey grade positioning, VAC Group and Earth Radar are able to visualise, post-process and analyse the subsurface. The technology is pushing the boundaries of GPR, having received a Federal Government grant to assist with its development. Mr. Simpson says with the trial phase complete it is now becoming a key part of VAC Group and Earth Radar’s complete service offering. Following the initial mapping and surveying phase and providing the drawing deliverables of existing utilities to the client, VAC Group can then undertake the non-destructive verification phase. 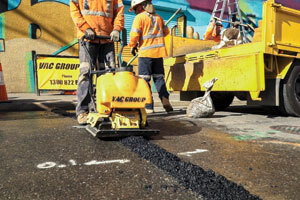 Depending on the ground condition, the VAC Group team utilises its innovative Bob-Saw technology. The Bob-Saw mills away the bitumen/concrete surface in pre-determined increments, enabling the team to get through hard surface areas safely and efficiently. The Bob-Saw technology combines a skid-steer mounted rock saw that, when used in conjunction with VAC Group’s vacuum excavation technology, allows the efficient and safe removal of asphalt or reinforced concrete. Mr. Simpson says this approach offers significant cost and safety benefits compared with the current standard practice of deploying a diamond saw and rock breaker, which can potentially damage services embedded within or immediately below the underside of the surface material. The VAC Group’s trucks use carefully controlled high-pressure water to excavate, producing a ‘liquid waste’ that is then removed, boasting a number of safety and efficiency benefits. Mr. Simpson agrees that the civil construction sector is beginning to appreciate the benefits of engaging a company like VAC Group, which offers a complete solution rather than relying on and having to manage multiple subcontractors. Since VAC Group integrated Earth Radar’s Latro and its other innovative utility and services mapping and locating capabilities into its well-established non-destructive excavation business, Mr. Simpson says the business is now at the stage where clients recognise the value that this complete service approach brings. “Our goal is to maintain a high level of quality and our technology and expertise enables us to achieve this. By visualising, analysing and modelling the location of existing services in the ground we enable out clients to make informed decisions with a clear understanding of the challenges to be addressed in their design,” he explains. “When there are many different businesses involved in the process, it is not possible to maintain the same level of confidence in the quality of the data. You can find yourself in a situation where you lose quality assurance through lack of communication,” Mr. Simpson says. 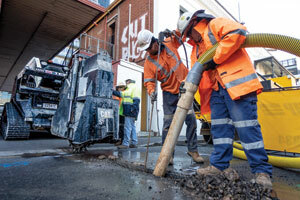 “What we’re doing by combining our full suite of services is maintaining complete control over the works. We’ll have a project manager as a single point of contact who liases with the client throughout to ensure the product or service we deliver meets their needs. “It’s that whole consolidated approach to what we do,” he adds. Mr. Simpson asserts that this was always the direction VAC Group was heading in and is the space it wants to sit within in the Australian market. That innovation then expanded into other areas, including more recently the development of a innovative GPR technologies through the expansion of the business with the Earth Radar team.